I’ve been thinking a lot about job titles recently, probably thanks to compiling my Chartership CV and applying for a couple of conference bursaries. I’ve tried to keep my CV up to date over the years but this is the first time I’ve really had to sit down and consider what it looks like to an outsider. One thing that has struck me through this process is that my current job title doesn’t really reflect what I do on a daily basis. Worse than this I’m starting to wonder if it’s putting people off! Above is the section of my CV which describes my current role. When I was putting together my CV I realised that only the last four bullet points are directly linked to my actual job description. Everything else is something I have done out of need or a desire to develop my skills. At this point I should say that I am very lucky to work in a large library which allows me to develop and take on new things. I wonder though how many people read the heading Senior Cataloguer and look no further as they think that all I do is catalogue? This is probably not helped by the fact that I have worked in a number of cataloguing related posts over the years, many of which have the word cataloguer in the title. I often get told by people that I’m not a “typical cataloguer” which I take as sort of grudging compliment but it does make me think again about my job title and if it’s giving people a certain impression of me. I’m sure I’m not the only person to wonder about this. In these days of constrained budgets and shrinking jobs is anyone a typical anything anymore? Aren’t we all having to take on jobs and responsibilities that we never thought we would have to, for better or worse? People short listing for interviews have very little time to read all the applications they receive so first impressions are important. I’m just wondering if the first impression that my job title sends out is the right one? "when I compare myself to others with the same job title I feel I carry out more varied and complex tasks"
"job title does not clearly express my actual role, area of expertise or skills"
"because I do so much more than that!" "librarian doesn't sum up the information literacy, training or general information wrangling that I do all day"
"it's too general and doesn't reflect the degree of professionalism required"
"for those in the library profession I think it's obvious ... however to the outside world I still use the word 'librarian' and this is what I put on my Twitter account for instance"
"it doesn't include library or librarian"
"it's a generic job title shared by several others who do jobs that differ from mine"
"I have the word coordinator in my job title which means nothing to anyone, but not the word librarian"
"library assistant implies I do non-professional work, which is not the case"
"title is 'Faculty Librarian' which doesn't explain anything! No mention of liaison or teaching etc." Quite a few respondents highlighted this issue of vagueness, claiming that their title was too generic to reflect the variety of things that they do. With roles changing all the time I’m sure it’s not practical to keep updating job titles but what does that mean for their worth? 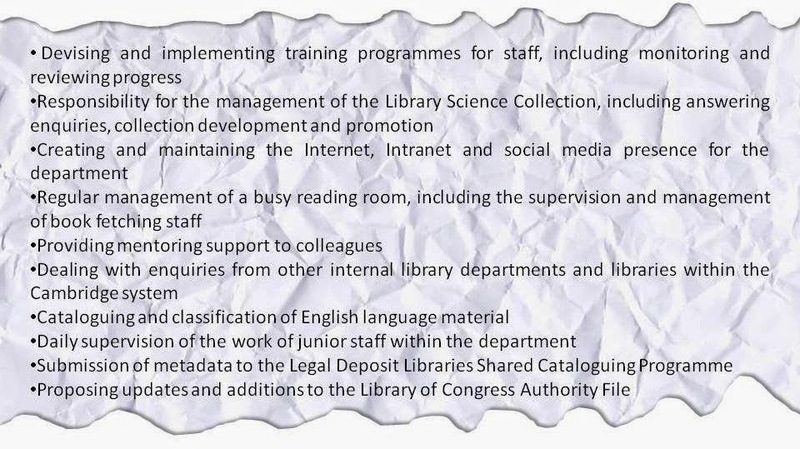 In contrast to this it’s interesting to note that people didn’t think their job titles would be too much of a problem on applications, as people within the library world would understand what they meant. This could be a positive or a negative and brings me back to my original point. People in the library world understand the term cataloguer but do they think all I do is catalogue books all day? Several cataloguers I know will tell you that we do a lot more than that! 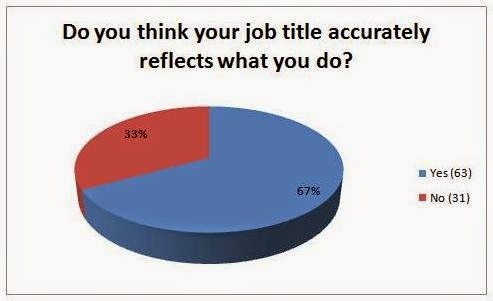 What all this adds up to is that there is no such thing as a perfect job title but there are several issues to think about. 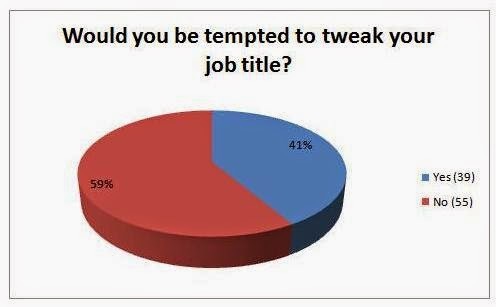 Finally I asked people if they would be tempted to tweak their title to better represent what they do. 59% wouldn’t be tempted but 41% would, which was a higher percentage than I was expecting. I’ll admit that I’ve been tempted to change mine to something like Senior Library Assistant in the past to avoid people assuming that all I do is catalogue but I decided against it as I thought it would cause more harm than good! I think what this very unscientific research has shown me is that I may be a little bit too sensitive when it comes to my job history. Having said that I think it would be a good lesson for us all to leave our perceptions of job titles at the door. Those judging applications need to look further than the title and see what the individual has achieved whilst the applicants (including me!) need to be better at demonstrating what they have done and not rely on their job title to tell the whole story.